The Grupo Puja were founded in 1998 in Argentina with the aim of creating a unique show based on the integration of several disciplines. They have brought together in a high altitude setting: theatre, circus, dance, architecture, engineering, multimedia and live music. They moved to Spain in 2002 and have given shows at festivals, fairs, exhibitions, sporting events, and tours throughout the world. Audiences in over 20 countries have been entertained and in awe at the fantastic displays produced by the company. Grupo Puja gave a stunning performance of their show in Huddersfield, UK, for the Festival of Light 2011. The Argentinian group braved the cold, wind and rain of a Yorkshire December night to demonstrate their unique act. 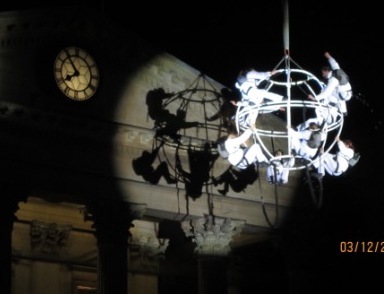 A mix of aerial acrobatics and dance at 100 feet above St George`s Square, the whole performance was accompanied by a talented musical band and female vocalist. Her impressively loud and eerie tones were an ideal support to the incredible action which was unfolding at such great height above the appreciative audience. 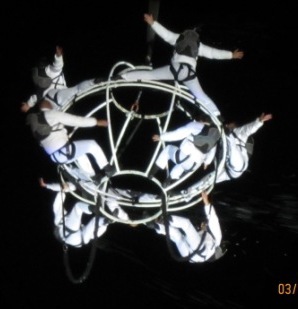 The whole show was based on a display choreographed around a spherical metal structure called `La Bola`. This and the 8 performers was hoisted by a powerful crane to over 100 feet, from where the various parts of the show unfolded. The crowd was also treated to some seriously good guitar sequences from the music director Gaston Iungman and his band. Gaston is a world renown guitarist, having studied in Argentina classical and electric guitar. His musical experience was gained in several bands composing and playing guitar and keyboards. This includes Organica one of the pioneering bands in South America to combine rock with electronic music. In 1998 he became music director and composer for Puja! He is also involved in other music projects and bands. The man in overall charge of the group is the Director general :Luciano Trevignani, who with his team of actors` directors and physical trainers, Martin Herrero and Cristian Weidmann, is always seeking to produce a variety of shows with new content. Performers : Fabian Nigues, Teresa Rodriguez, Jose Santiago, Jose Maria Banon, Adan Garcia, Gema Segura, Isabel Dolores Teruel, Cristian Weidmann, Lazaro Acosta, Sheila Ferre.